The 25th death anniversary of Vijaya Kumaratunga fell on February 16. Vijaya and my father Ossie Abeyagoonasekera were close friends and I remember him visiting our place almost every day and working together until his death in 1988. My father was very supportive for his political cause. Even though I was quite young when he died, I remember how people gathered to see him. His personality was such that he managed to bring happiness to everyone, be it through his life as an actor or as a politician. Some who didn't like his politics loved his movies. 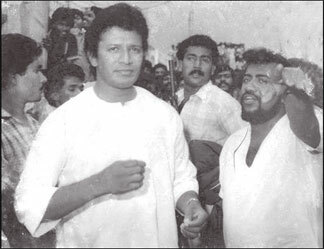 Vijaya along with my father and few other members of the party were jailed in 1982 as Naxalite prisoners during J.R. Jayawardena's period in office. They went through many hardships in their political journey and one could call Vijaya's was an unfinished life. He was assassinated at a young age of 43. He was the founder of Sri Lanaka Mahajana Party (SLMP) which used to be the third largest party some years ago. The SLMP almost died down as it lost many members, about 117 who were assassinated during the 88 insurrection. Vijaya was the first to be killed. Vijaya's courage became evident when he made a journey to Jaffna in 1986 to meet the LTTE leaders such as Kittu and Raheem. My father and Felix Perera accompanied him. The intention of this journey was to engage in a political discussion in order to free Sri Lankan soldiers who were detained by the LTTE. They managed to win the hearts of the Tamilians of Jaffna. While delivering one of his most memorable and remarkable speeches, Vijaya stated that "Sinhalese and Tamils are one ..." For a politician to utter these words in the political context which prevailed in 1986 requires courage. It should be noted that he never changed his position. He was called a traitor by some in Colombo after this journey. Before his death, Vijaya was about to create a grand political alliance which was later created with the leadership of my father - the "United Social Alliance" under which my father contested for the Presidential election in 1989. Vijaya was not afraid to meet Tamil political leaders to discuss solutions for the national question. He had a close relationship even with South India. I remember one photograph where he was pictured with M.G. Ramachandran. He had the charisma to win people and people gathered to see him and listen to his speeches where ever he visited. Vijaya did not go behind money or luxuries in life. He could not be bought by anyone. He was a true politician with a kind heart. My father commemorated Vijaya each year until his death in 1994. He built the statue at Polhengoda where he was assassinated, which was later taken to Kandana. He opened a museum so that people could see and remember this impressive leader. He released a stamp, a sports trophy on behalf of him and every time he spoke of Vijaya, he was emotional. He loved his dear friend. Every single speech I have listened to, had a bit about Vijaya and the slain heroes of the Sri Lanka Mahajana Party. Vijaya was a courageous leader. He epitomized qualities of a courageous leader by fearlessly adapting and changing with the intention of ensuring a greater benefit to the society without running behind popularity. Vijaya believed in a multiethnic society and in devolution of power. He expressed his support to the Indo-Lanka Accord which brought about the 13th amendment. When it is difficult to find a handful of politicians who would be courageous enough to engage in a constructive debate on the 13th amendment even today when it had been implemented for over 25 years, the challenge, Vijaya took in 1985 was enormous. One might think that most of the politicians did succumb to popular politics of engaging in ethnic politics. But Vijaya was one of the few exceptions. 'To stand against the tide when the tide is high is foolish and irrational', one might say. Leaders sometimes need to make unpopular decisions as it was with Abraham Lincoln who implemented the 13th Amendment in the US constitution to give rights to the African Americans. It was not the most popular thing to do at that time. It will be history which decides whether you are a great leader or not, as it is the case with Abraham Lincoln. In the Sri Lankan case where ethnic harmony connotes how much inter-ethnic and communal trust you can build, actions of individuals such as Vijaya meant a lot for all the communities in Sri Lanka. Memories of Vijaya still bring hope and stands for the reality that not all Sinhalese are bigoted. Had Vijaya and many other leaders who lost their lives were alive today, we could have witnessed a transformation in our political culture. He never had a price tag for him; he was honest and was truly dedicated to solve the national question. Vijaya introduced many politicians. However, most them do not represent his party or ideology today. Only a few mention his name. In his death anniversary, we can pay tribute to Vijay by being introspective on what we can carry and introduce to the younger generation from his personality, from his political career and from his life.